I received some of the mentioned items in this post in exchange for an honest review. As always all thoughts and opinions are 100% my own. There are so many beautiful things about motherhood. So many things that counter the craziness when you wonder, am I going to survive parenthood today? Today I’m talking about something a little less tear jerking. It’s fashion guys! Mommy and me or Daddy and me fashion is so much fun and totally adds more fun to parenthood! From day one I enjoyed dressing Izzy up as a doll. After birth my recovery was rough but I enjoyed putting Izzy in darling little outfits and finding a matching bow or hat. It was one of those fun moments of the day that gave me a smile when I was feeling the post pardum blues. Now that Izzy is bigger I seem to find more and more mommy and me fashions and I love them all! 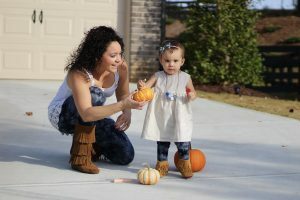 Similar colored jeans, fringe boots and gray sweaters make for a fun mommy and me fall look. Mommy and me fashion doesn’t have to be the same dresses or the exact same outfit. You can pull alike pieces together for a simple and fun mommy and me look. 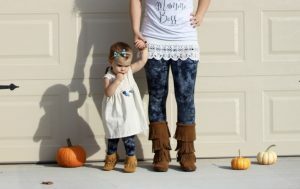 For our mommy and me look below you can see we have on matching leggings and similar boots. I gave us tops that were not matchy matchy but similar in the fact they are both lighter colors. I turned my top into a tunic and she has a dress over her leggings. Loving all the mommy and me looks!! Gorgeous girls! This is adorable! You make me want to do more mommy and me looks with my daugher. Hehe thank you Madi! Yes! All the mommy and me! ?? Those boots on you guys are so adorable on you both! you two always look so cute together! these boots on you both are my favorite! Love love love the leggings! They are so colorful and so much fun! 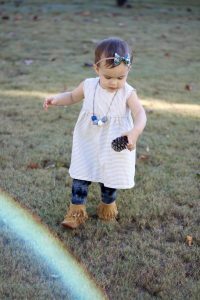 The boots are an adorable addition to any Mommy and Me outfit! Great fall choices! You guys are THE cutest!!! I can’t get over your matching boots! So cute! Hehe thank you so much!!! ? Well you two are absolutely adorable! Love it!! OMG you two are so cute! LOVE the matching boots… I need to get me some of those! Love those matching boots! So cute! Isn’t it the best? ? Love Mama & Mini matching! Y’alls boots are adorable! Love the fringe! You two are seriously the cutest!!!! Oh my heavens, I adore you!!! Such a great post, momma!! I can’t wait to continue reading your blog!! Love you! Thank you for the love! I’m ready for mommy and me buns like you and your girls do! You look amazing! Loved those boot! Little Izzy is so adorable! I love Mommy & Me matching outfits. You two look super cute. Love your mommy and me looks! Just so adorable and those boots though!! They are so soft! Thank you! This has seriously gotta be the cutest thing ever!!!! I’ve been eyeing some SweetNSwag shoes for my daughter and now i’m totally sold! so cute! Thank you! Aren’t they too sweet? You two are ADORABLE!!! The matching fringe boots… I die!!! Thanh you! Gotta keep up our own looks while matching ? Her little dress!!!! I can’t even handle the cuteness! 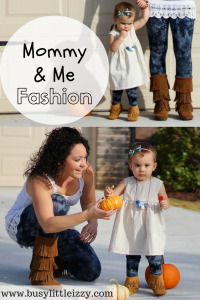 Oh my goodness, these mommy and me looks are adorable!